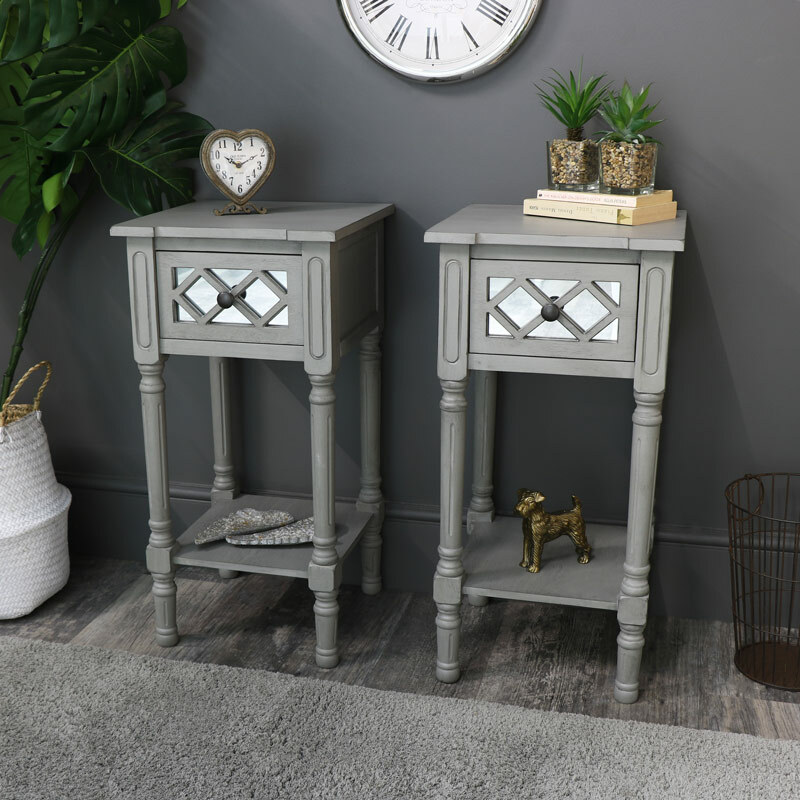 This pair of bedside lamp tables are from our stunning Vienna Range. 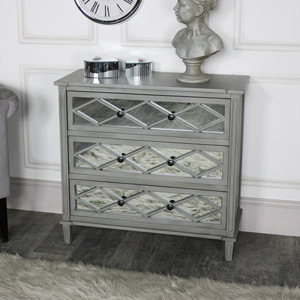 Beautifully styled in a soft grey finish that will add some vintage elegance to a living room or bedroom. ORnate, vintage elegance that will be perfect used in the bedroom by the bed or used in the living room or hallway as lamp tables. Great storage with 1 drawer for holding bits and bobs and accessories and a shelf underneath for display. These could be used as a pair or individually wherever needed. With an understated elegance that does not overpower a room but enhances it. Mirrored inlay on the drawer front that is gracefully highlighted by the ornate latticed detailing, complete with a round brass drawer knob. 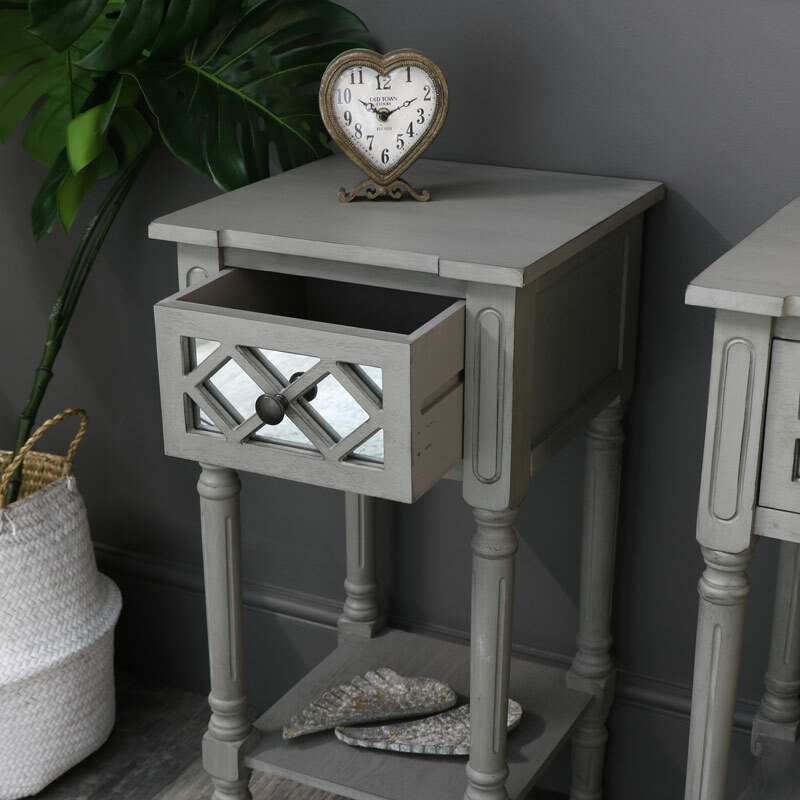 This pair of bedside lamp tables are from our stunning Vienna Range. 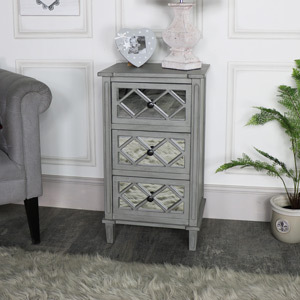 Beautifully styled in a soft grey finish that will add some vintage elegance to a living room or bedroom. ORnate, vintage elegance that will be perfect used in the bedroom by the bed or used in the living room or hallway as lamp tables. Great storage with 1 drawer for holding bits and bobs and accessories and a shelf underneath for display. These could be used as a pair or individually wherever needed. With an understated elegance that does not overpower a room but enhances it. Mirrored inlay on the drawer front that is gracefully highlighted by the ornate latticed detailing, complete with a round brass drawer knob. 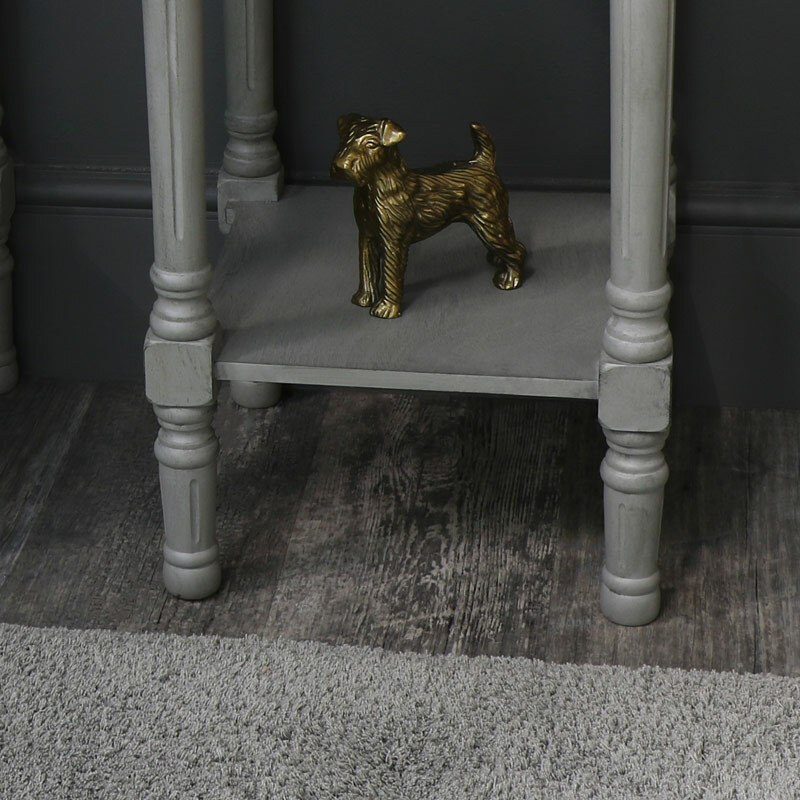 Made from wood and finished in a slightly distressed pale grey finish, the overall size measures 36cm x 72cm x 36cm (width x height x depth). This bedside lamp table comes partially assembled with the legs to attach. We have more furniture available in the Vienna Range, with a chest of drawers, spacious sideboard, cupboard unit and console table, so you can create the style and living space that suits you. This bedside lamp table comes partially assembled with the legs to attach.